Combined treatment methods for optimal results. When two consistently high-performing forces come together, great things happen. Cape seals are an example of just that. The dynamic duo of roadway maintenance, cape seals combine the benefits of both a slurry surfacing system and a chip seal, which enables them to provide more protection and durability as compared to that of other preventative measures alone. At an average cost of $4.00 per square yard, cape seals can extend the life of a roadway by roughly 6-8 years by addressing both preventative maintenance and rehabilitation needs. Moderately to severely cracked pavement, loss of friction and water penetration can all be addressed using cape seals. However, they are not recommended for use on unsealed cracks ¼” or greater (unless a scrub seal is used) or for ruts more than 3/8” deep. A combination of Ergon Asphalt & Emulsions products eScrub (a chip seal system) and eFlex (a micro surfacing mixture) can be used in tandem to provide a reliable cape seal treatment. A mix design for the individual treatments is required. Clean pavement prior to application. 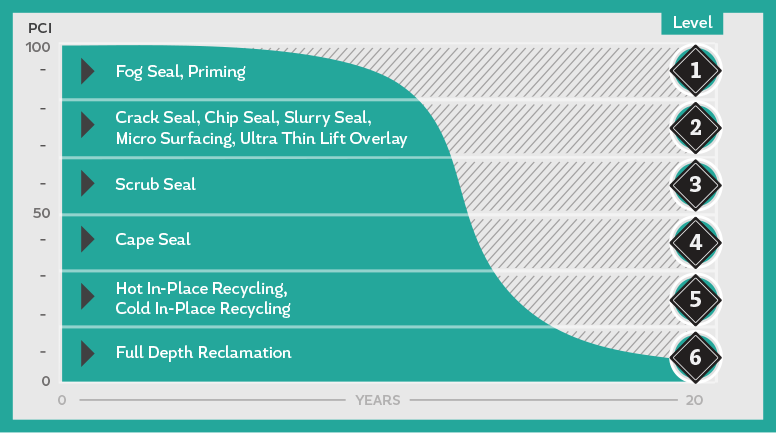 Allow up to 3 days for the chip seal to cure before applying the slurry surfacing treatment. Follow best practices when patching and leveling, and during final application of all treatments. Construction Specs for the individual treatments can be found in the Sample Construction Specification Guidelines section of this website.